We have a lunar eclipse coming up on January 20, 2018 that will be visible in North and South America. It will start the evening of the 20th and run overnight into the morning of the 21st. From Detroit, Michigan the Partial eclipse starts at about 10:33pm, with totality begining about 11:41pm on the 20th. Mid eclipse is at 12:12 am on the 21st, and totality ends at 12:43am. The partials finish up at 1:50am on the 21st. So this will be well positioned overhead for us in Michigan. All we need is clear weather. You can practice taking pictures of the moon over the next 4 weeks to get some practice in. Exposures, etc. for the various phases are a good indicator for the partial phases of an eclipse. With digital cameras, the feedback is immediate, but it is always good to practice ahead of time, to make sure you have all your equipment you need, and it is in running order. On August 4, 2018 we had a crew out to tear down the two observatories here at the Northern Cross Observatory complex. The dome was 40+ years old, and the roll off 34 years old. The dome had rotted away about a decade ago, and was no longer in use. The outriggers of the rolloff have degraded and were at risk of collapsing. The roof itself was getting too difficult to open as well. So we took them down. The plan is to have a new one built in a couple of weeks on the old platform, then put the imaging system back into the observatory. The new building will have a powered roof, and hopefully will out last me. Here is a video of segments of the tear down. 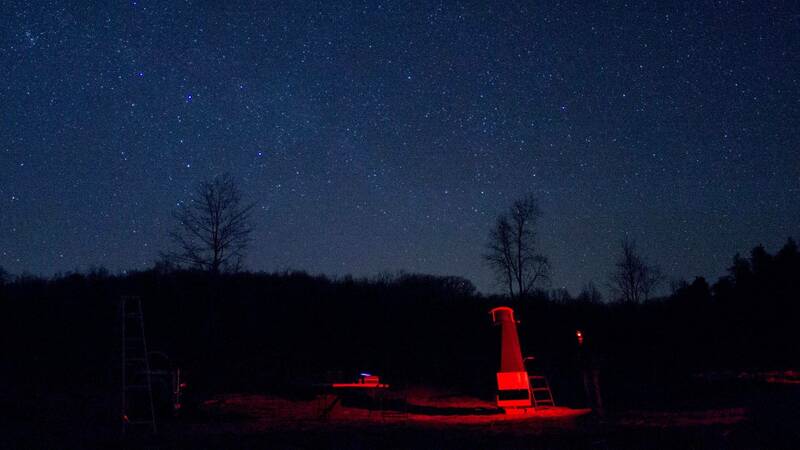 I'm hosting a star party @ Boon Hill for the weekend of the Perseids. A change in plans. I've decided to have the two observatories torn down the weekend of August 4th. The dome one has been out of commission for over a decade due to rotting wood. That building was built in the 70's The roll off roof one needs to be replaced. So I've invited people over for a tear down Saturday. A new building will be erected later this year, with a motorized roof. I've contracted Backyard Observatories out of Ohio to do the build. They will schedule sometime in August or September, so once I've take down the building, my imaging rig will be packed away, or I'll go mobile with it, until the new building arrives. Over the next 6 weeks or so, I'll be doing some much needed maintenance on the observatory. The track and rail system is 34 years old, and needs components replaced, since the outrigger wood has warped over the years. The plan at this point is to run new rail beams, and steel runners. In addition, new doors need to be built. Once these are completed, a new drive system for the roof needs to be designed and built, to allow this old guy to open it up easier. We may replace the shingled roof with a metal roof, to lighten it, and make snow removal in the winter, a bit easier. I'll setup some working weekend events on the facebook page, soon.